Indu Arora is an international Ayurveda-Yoga Therapist and Master Teacher. She is the author of “Yoga-Ancient Heritage Tomorrows Vision” and “Mudra-The Sacred Secret”. Indu Arora speaks from her soul, a place of love, experience, and dedication to something that has been a part of her life since ever. Her philosophy? “Nothing has the greatest power to heal… but Self”. There is nothing more valuable or magical than that. If you are lucky enough to work with her you will see what I mean ! She welcomed us into her world, sharing her knowledge of Yoga, Ayurveda, Food as Medicine, and Yoga-therapy. Our sincere gratitude, Indu ! 1. Indu, you are the owner of Yogsadhna since 15 years. What is Yogsadhna, its goals and philosophy? And how did you come to this journey of sharing Yoga? We have done every possible thing we could do in our capacity, utilized all sources of intelligence to find help. The only answer we find is that we have to go BACK. We have to go back to the basics. We have to go back to our Roots. We have to go back to ourselves. I believe that this is the only way to find the real solution. It has nothing to do with West or East. It has to do with human beings. No matter who we are, where we are from and what we do, we have to choose a path back Home. We have to choose the path back to ourselves. Nothing has the greatest power to heal, but self ! I started with my Yoga journey at the tender age of 16 when I met my first spiritual master who made me realize that there is more to life apart from food, fun and movies. At the age of 19, I met with my Yoga Guru who initiated me into the practice of Kriya Yoga. Since then, I have been blessed with learning under many Masters of Yoga and Ayurveda. The journey is never ending and now I feel that I learn from everyone who touches my life, from some what to do and from some people what not to do. It is all Yoga and not just a couple hours practice on the mat. We have to choose the path back to ourselves. Nothing has the greatest power to heal, but self ! 2. You promote a way of living life through Yoga, Yoga Therapy, Meditation and Ayurveda for 15 years. This holistic approach integrating body and mind is sometimes difficult to explain in the West. How did you manage to bring simplicity to these concepts and make them practical ? Indu Arora: Simplicity is what everyone connects to most effortlessly. Complexity is favored by the intellect and simplicity is the food for the soul. Intellect is only a part of us but not who we are. I feel that if one has simplified something for themselves with their Sadhana then one can present it simply. One needs to develop and have appetite for knowledge and then digest it by contemplation, self- inquiry, reflection and practice until it becomes who they are. So that it is not just what you speak but what you vibrate, pulsate and radiate. 3. Did your practice or understanding of Yoga and Ayurveda change through the years ? If so, in which manner ? Indu Arora: Practice is bound to change with time. Even the meaning of the same word changes as we grow. Think of the meaning of the word “Freedom”, what it was to you as a child, teenager, adult and what it shall be as you grow. This is a natural process. Our priorities, experiences, goals and our choices in life bring a change to our practice. To age is inevitable but to grow is an option. We make a choice every moment and we have a choice in every situation, to learn and to grow or to do well and to blame. Yoga was a curiosity for me at the age of 16 and now it is my life. Ayurveda was what my mother and grandmother said, suggested or cooked when I was a child and now it is foundation of my everyday living. These practices are means as well as the goal and not merely tools. For me to understand “The Wisdom of Life: Ayurveda” and to live “The life of Union and Dissolution: Yoga” is what they have become and I shall not waste any time or opportunity to undo and do what is required. The growth is when you can peel just one more layer and keep doing it till you can release the space hidden inside. When the outer space and inner space becomes one then the practice is complete, until then do not stop. One needs to develop and have appetite for knowledge and then digest it by contemplation, self- inquiry, reflection and practice until it becomes who they are. So that it is not just what you speak but what you vibrate, pulsate and radiate. 4. You said: “Any activity can become Sadhna (spiritual practice) as long as we put our Bhavana (sincere emotion of devotion) in it.” What that means and how to improve our Sadhna daily ? Indu Arora: Sadhna is a choice and practice to gain mastery over something. Any activity becomes sacred when we add emotion of devotion with the attitude of dedication and surrender to it. That is the difference between Sadhna and work? We work because we have to; we do Sadhna because we want to. The only way to improve Sadhna is to have the desire to want to improve, grow and be ready to face challenges. Sadhna is not a feel good practice; it is “Face the Truth” practice. Everything else falls in place once we have clarity of what we want, how badly we want it and what can we sacrifice from our personal life to make it happen. Every day have the same burning desire (not fleeting desire) to grow and to simplify. One of the unique and profound practice in yoga is the observation of Sandhi. Sandhi means the transition timings. These transitions are of two types, Kaala Sandhi and Kriya Sandhi. Kaala Sandhi is the meeting point of day like dawn, dusk, mid-day and mid night. Kriya Sandhi is the space between two activities. Once we start observing these transitions, we invite pause and reflection in our life. It becomes more real then more robotic. These pause and such reflections are fuel to our daily Sadhna. They keep us in check. 5. When you say that “We have to choose the path back to ourselves. Nothing has the greatest power to heal, but self!” is that means that a spiritual practice is a key of healing ? Indu Arora: It simply means that the solution is within us. We can our get answers from outside and answers can bring intellectual gratification but not contentment. Know that every question has the potential to become a Self Inquiry. We made enough efforts to find answers outside and we have created a big chaos, searching within is the only road less travelled. 6. Yoga therapy is healing discipline that offers a broad range of tools for supporting health, healing and personal transformation. What are we actually doing in Asana ? Indu Arora: Asana is simply a seat of the mind, taken through the body and by the body. It is state when no matter how we choose to place our bodies; our minds and breaths stay calm, smooth, quiet and clear. There are asanas to cleanse, strengthen, bring flexibility, nourish, relax and meditate. It is a Work-In and not Work-out practice. As one grows in the practice, one moves from cleansing to meditating asanas. Asana is incomplete if it does not have the element of effortlessness and stillness (of breath, emotions and mind) to it. Every time one practice, it is like a surgery, we peel the layers of discomfort, conditionings, fears, emotions and thoughts to release the prana trapped within. The practice of asana prepares the body to extract prana from breath, food, water and sunlight. Every time one practice, it is like a surgery, we peel the layers of discomfort, conditionings, fears, emotions and thoughts to release the prana trapped within. 7. 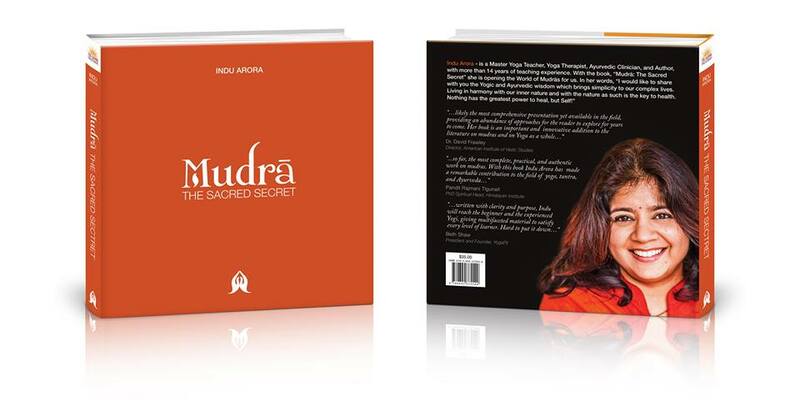 Congratulations on your most recently published book “Mudra: The Sacred Secret”. It offers the readers an opportunity to further enrich the healing modalities of their practices. How to use the mudras for healing and how long should we meditate on them a day ? Indu Arora: Thank you for the wishes. It has been a result of lifetime practices. We all practice Mudras day in and day out. The way we gesture, move or stay still is all Mudras. When we know about what we are actually doing than we can access the hidden intelligence of the body, mind and breath. Mudra is a bridge to not only understand ourselves and our actions but also to do some specific that can help is balancing the five elements (earth, water, fire, air and ether) that out body is made up of. As a beginning point, I would suggest one to embark on this journey with the Mudras of five elements, starting from earth to ether. Hold each mudra with both hands for 2-5 minutes. Repeat the practice 3 times a day. Every Mudra creates a spin of energy that stays for 6-8 hours. It would be best to practice a mudra empty stomach. I would highly recommend users to read my latest book to understand this subject as I feel that apart from being a spiritual practice, it has amazing physical benefits too. 8. It’s something very intimate and difficult to connect to our mind, “Go inside and become insightful”. Of course this experience doesn’t depend on how many books we have read or how many trainings we have done, it’s a personal journey. As you say “there are no shortcuts”. Then, my question is, how to go within confidently ? Indu Arora: In any journey, the presence of a Master, guide, teacher or Guru is crucial. Guru is like the light that enlightens our path. Once you get guidance from such a Master, do not look for shortcuts or answer outside. If you do not have the blessing of a Guru yet, remember that, “The Guru appears when the student is ready”. The most important thing to do is to be a student from all your heart and soul and have a true yearning to learn and grow. Once that yearning is there, it is only natural that the forces of nature guide us in all possible ways so that one may lead a life that is in coherence with the laws of nature, is in harmony with evolution. We do not need books to tell us what we need to eat; we need to simply listen to our bodies. 9. 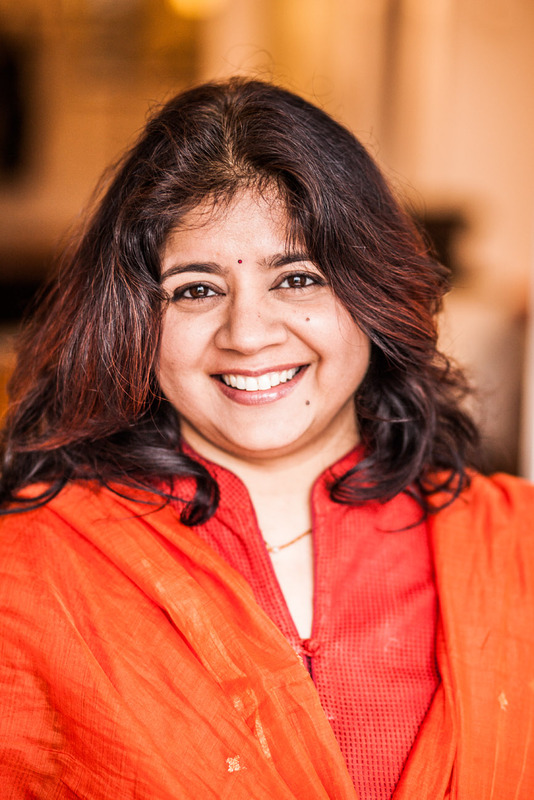 You spoke on “Food is medicine” at the Online Ayurveda Summit. This is a big truth since Hippocrates and in many ways, we don’t really need much advice because we already know basically what we should do: eat a variety of foods, especially whole grains, fruits, and vegetables; minimize candy, soda and other empty calories; and watch how much we eat. And of course do some physical activity each day. But we still suffer from higher rates of obesity and chronic disease than ever before. How do you explain that ? Indu Arora: How many people are doing that what you shared? Most of the people eat just to fill stomach, because it’s time, because it is tasty, it is quick or because it helps them forget the real question about their life. We have masked our lives with way too much stimulus. This distraction is not serving us to even question what food is. In earlier times people moved so that they could hunt for food, now people move because they have way too much food. The whole concept of food has changed over time. The food was nourishment as written in texts and now food is something that we simply consume. We do not realize that food is what we eat, drink, smell, taste, sense, see, hear, think and surround ourselves with. The main problem is the lack of pause in life. This pause is not tamasic but sattivic, as it bring clarity with reflection. Stress related conditions, obesity and chronic diseases are increase because the body is continuously trying to communicate but we suppress the entire intelligence of the body by putting a band-aid to pains, aches and all other discomforts/ diseases. We do not respond to a headache, we react to it by popping a pill. The moment we change our reactions to responses we shall start making mindful choices. We do not need books to tell us what we need to eat; we need to simply listen to our bodies. Yogic wisdom suggests that the moment a craving arises watch its internal pathway instead of giving it a temporary boost by indulging in it. This way you will find its roots at the subconscious level. 10. How to deal with craving from a Yogic and Ayurvedic point of view? And how should we start ? Indu Arora: Cravings can be healthy as well as unhealthy. When the root of craving is based on how it tastes in your mouth and not how you feel after you consume it then it is an unhealthy craving. A healthy craving satisfies one from deep within. As per Ayurveda, the best way is to satisfy all the elements that our body is made up of is to make sure that our diet has all the six tastes (sweet, sour, salty, bitter, astringent and pungent). As per our individual constitution, season and time of the day the ratio of these tastes differ/ change. If one eats as per these guidelines then the chances of cravings are minimized. Apart from that avoid eating food while watching television, reading a book, traveling, walking etc. This also adds to dissatisfaction and aggravation of doshas (imbalance of elements). Try to avoid talking while eating and also while you are emotionally upset. As your food-so your thoughts! Yogic wisdom suggests that the moment a craving arises watch its internal pathway instead of giving it a temporary boost by indulging in it. This way you will find its roots at the subconscious level. On another level practice Nadi Shodhan (approximate translation Alternate Nostril breathing without breath retention) before surrendering to your craving and see if that has already balanced your system. Another simple technique is rotating the tongue 21 times around the teeth in clockwise direction to activate the salivary glands and sweet taste in mouth. Sweet taste in the mouth represents the earth element. It brings satiety, stillness, grounding and satisfaction. Try these simple tips to deal with cravings ! 11. Which advice can you share to eat mindfully ? Indu Arora: Become mindful in your day to day life. Only then the activities which are generally performed as if we are on auto-pilot mode can become mindful. Mindfulness is not a practice; it is a choice and a lifestyle. 12. What are your recommendations to find the perfect balance, harmony and simplicity in our complex life ? Indu Arora : Knowing that every moment is a choice and every choice creates harmony and balance. Filter constantly what does not serves you any more, be it food, thoughts, material belongings or toxic relationships. Take a break, create a pause in life. Nothing has the greatest power to heal, but Self. Visit Yogasadhna website: www.yogsadhna.com ! Previous Alkaline diet & Ayurveda : an interview with… Anu Paavola, ayurvedic partitioner in London ! Next In interview with… Mohsin Ali Khan, indian spiritual musician ! It was a pleasure being Inter-viewed by you dear Armanda. Looking forward to stay in touch. This is amazing. Very powerful & impressive wisdom but with the simple expression. Any one can connect and understand the simpler way of living healthy and wealthy life.